Despite the environment of intimidation and treason accusations, which has been practiced by the Egyptian authorities, March witnessed a number of social and labor protests; including the protests of first-grade secondary students against the new examination system after the tablet malfunction which disrupted the students’ performance. Also, the scene of the principle of Gamal Abdul Nasser School, who pulled a student’s hair and brought her to the ground, ignited anger among students and parents. Also, this month witnessed an another type of groups that exercised their right to protest, including two protests carried out by workers abroad demanding the embassies of Egypt to intervene to protect them, and the complaint filed by residents of Garden City because of the logging on the Corniche’s trees. Despite the decline in the number of labor protests this month, however, there was a big sit-in for the engineers and workers of Al-Nasr Contracting Company, in protest against the non-payment of financial dues, and security services faced it with the arrest of 7 employees of the company, including trade unionist Talal Atef. Threatening to Protests: 1 case. Dozens of workers of the National Cement Company organized a vigil, in front of the headquarters of the Ministry of Public Sector, on March 31st, to demand the operation of the company’s factories, or to compensate them appropriately after the government’s decision to liquidate the company. About 500 workers at Electro star Electric, organized vigil on March 4th, in front of the company’s headquarters, in protest against late payment of salaries, deduction of allowances and profits. About 400 workers working in “Hassan Allam” company organized a vigil, on Sunday March 3rd, in protest against the non-payment of allowances and profits, and the reduction of salaries. The engineers and workers in Al-Nasr Contracting Company organized a sit-in on March 4th to protest the failure to pay their dues for 3 months, and the security services arrested 7 employees, including trade unionist Talal Atef. About 30 Egyptians working in Kuwait organized a sit-in in front of the Egyptian Embassy in Kuwait on March 12th on the background of exposure to fraud, by a recruiting company in Kuwait. Around 1200 Egyptian workers in Milan, Italy, organized a labor strike to demand higher wages and settle their dues from previous years. Magdi Al-Badri, head of the union committee for the employees at Alexandria University Hospital, entered an open hunger strike on March 5th after the suspension of his financial dues and his dismissal from work. A number of graduates from Faculty of Medicine class 2017 launched a hashtag on social media named “Doctors’ strike to 2019 Medical Services” in protests against not including the house office year to the years of work. Threatening to Protests: 4 cases. Leaving work and failure to find a new opportunity. Marital disputes due to low income or demands for increased household expenses. 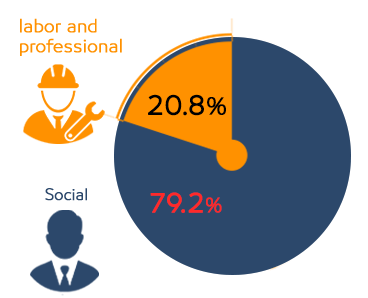 The children stopped sending expenses to the elderly parents. The elderly father failed to get a job for his children. Difficult financial conditions and inability to get married. The people of Al-Warraq Island organized two events; the first was protest in front of the ferry after Friday prayers March 15th to protest the enforced disappearance of 3 of their children, who were (Al-Sheikh Said Mustafa, Ahmad Gamal Ibrahim, and Ibrahim Shaarawi), and the second was a mass conference on March 22nd demanding the immediate release of the 3 after being accused of fabricated charges. Grade-1 high school students organized 2 vigils in protest against the failure of the electronic examination system, where a group of students gathered in the courtyard of Gamal Abdel Nasser Secondary Girls School on March 24th and the students of Sharqia organized a protest in front of the governorate building in Zagazig on March 25th. Dozens of lawyers in Itay-Al-Baroud in Beheira organized a protest on March 30th to express their condemnation of the assault of a police officer in on lawyer Aya Abdul Rahman. A number of male and female students of the nursing school in Kafr El-Sheikh governorate organized a protest in March 21st against their transfer from school to another place. A group of young people organized a protest on March 24th, inside Egyptian Refining Company to claim them within the 30% quota of assignment among the surrounding community. A number of students of the university dorm of Al-Azhar University in Assiut organized a protest march on March 24th to demand clarification of what had been raised about the abduction of a student, and finding her dead body. Owner of Mercedes cars – 2019 model – organized 2 vigils; one on March 2nd and the other on March 9th in protest against the company deliberately hiding its intention to reduce prices by the beginning of 2019. Dozens of people in south Aswan gathered on March 25th to demand the need to create modern and safe speed bumps after running over a student. Dozens of families of the victims of a young man who had killed 7 people in Giza gathered on March 19th, in front of Aussim Central Hospital. Dozens of people from the village of Mastai in Monufia gathered on February 28th in front of the house of the murderer of the girl Radiana, to expel him from the village after serving a year in prison. On March 29th, a number of residents of the village of Sarsu al-Baramoun in Daqahalia, gathered to demand industrial speed bumps to reduce accidents due to excessive speed. A number of residents of Esna south of Luxor gathered in front of Esna police station on the morning of March 4th demanding the return of their money from a woman who had been accused of fraud. Egyptian National Railways’ passengers gathered twice this month to protest late train schedules as some passengers of the Lower-Egypt sector, gathered at the front of the Misr Station on March 3rd, and on Al Manashi line on March 21st. On March 18th, a number of parents gathered in a primary school in Kafr El-Sheikh to protest a teacher’s harassment of a 5th grade student physically. On the morning of March 4th, hundreds of people gathered in the village of “Kafr Dawoud” in Sadat City after two children were killed and a girl was hit by a speeding car that escaped while crossing the road. On March 24th, the Civic Movement submitted a request to organize a protest before the Parliament against the constitutional amendments. Zamalek club president threatened on March 26th to gather the icons and previous players of the club to make a protest against the Football Federation and the National Media Authority. A member of the Freedoms Committee of the Bar Association, Amr Khashab, called on March 29th to organize a sit-in to protest the assault of a police officer on the lawyer Aya Abdel Rahman. Mohamed E. M. announced his intention to burn himself in Port Said on March 26th, in protest against the authority of localities’ removal of his kiosk. With 2 cases, demonstration came second, both of which were against the new education system. The first was by male and female students demonstrating on March 25th in Helwan, and the second was by dozens of female students of the Girls Secondary School in Monufia on March 25th after exiting the school. The resident of Garden City district filed a complaint on March 27th because of cutting off the trees by the Corniche. 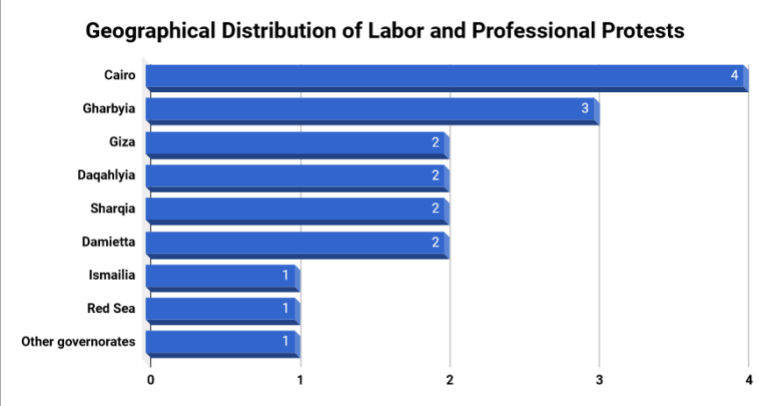 Cairo topped all governorates in terms of labor and professional protests for March, while the protests by Egyptians abroad came second, and Alexandria and Giza and other governorates came third with one protest each. 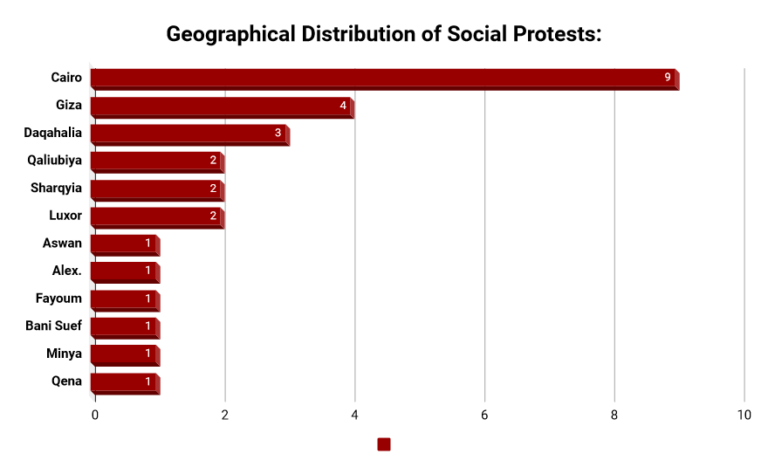 Cairo topped all Egyptian governorates in terms of social protests during March with 11 protests, Giza came second with 7, both Monufia and Kafr Al-Sheikh came third with 4 each, Daqahalia was fourth with 2, then (Menia, Port Said, Sohag, Aswan, Assiut, Luxor, Alexandria, Beheira, Sharqia, and Qalubia) came fifth with 1 each. 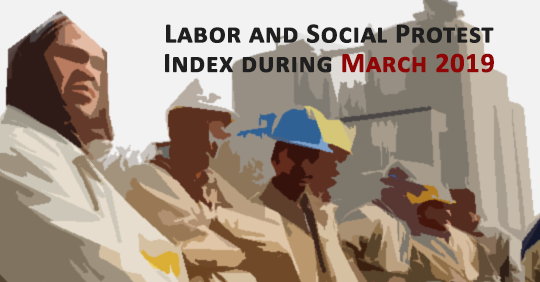 The health sector topped all labor and professional protests during March with 4 protests, both construction and other came second with 2 each, and third and last were both chemical industries and metal & engineering industries with 1 each. 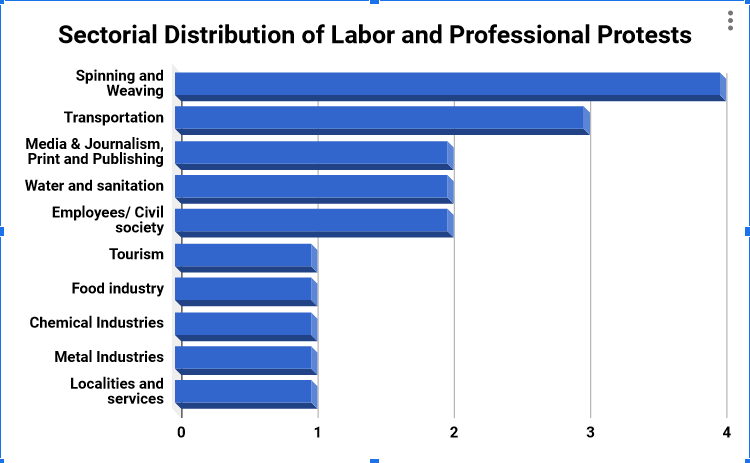 As shown in the below chart, “others” sector which included suicide and attempted suicide cause of poor living conditions topped all other sectors of social protests with 12 protests. Education and scientific research came second with 6 protests, localities and services came third with 5 protests, security came fourth with 4 protests, sectors of (lawyers, transportation, and commerce) came fifth with 2 each, and sectors of (housing, petroleum, sports, health, and employees) came sixth with 1 each. The Egyptian authorities have zero tolerance for any objection or protesting, where every protester is considered an enemy of the regime, being charged with belonging to terrorist groups. They also reject all means of protest, both group and individual. 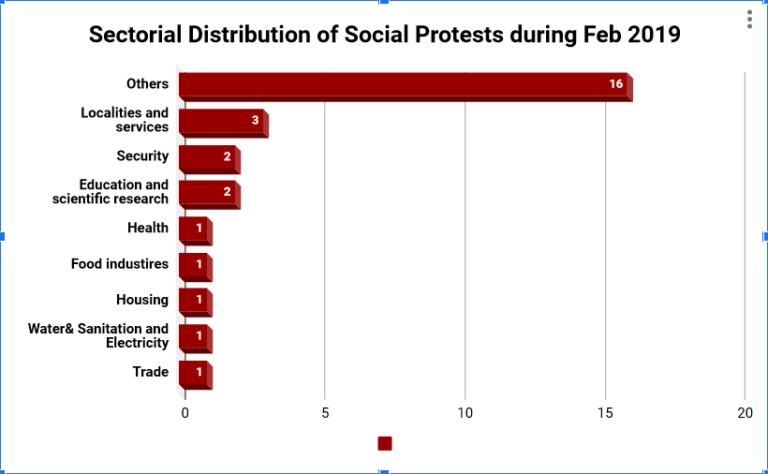 The charts show the increase in the number of protests in general compared to last February; however, social protests increased this month while labor protests declined. Also the charts show the increase of number of vigils compared to suicides and attempted suicides which decreased compared to other forms of protest.